Get up and down your porch stairs in rain, snow, or sleet with the Indy Outdoor Stair Lift. Built to withstand years of exposure to storms and seasonal changes, the Indy Outdoor Stair Lift has weather-tight covers and provides mobility in all kinds of weather. To accommodate your needs, our outdoor stair lift can be installed to either side of a staircase, and it mounts directly to the stairs instead of a wall. 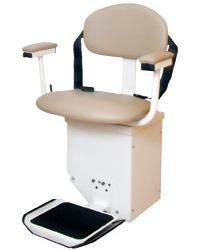 Indy Stair Lifts, the national leader, offers an outdoor stair lift that withstands storms, seasons, and years of use. It’s protected from the elements by weather-tight covers and provides comfort with a 19-inch wide seat that swivels 90 degrees for easy entry and exit. We’re dedicated to personal safety and equip our Outdoor Stair Lifts with safety sensors that stop the lift to avoid stalls if something is in the way. Indy Stair Lifts beats the competition with a 10 year warranty on our Outdoor Stair Lift, with a full year warranty for labor. We also offer 24/7 phone support at 888-203-5754 for year round service. Call us with questions about your outdoor stair lift any time and a professional representative will be happy to help. You can call right now for more information about our complete line of stair lifts for straight and curved stairways as well as the Outdoor Stair Lift model. Indy Stair Lifts is dedicated to helping you regain your independence and enjoy your home with industry leading stair lifts at economical prices that are renowned for their comfort and durability.